After four years of writing and performing half hour episodes of stand up for his TV show, CONTENT PROVIDER is Stewart’s first brand new, long-form, full length show since the award-winning Carpet Remnant World. The show opened at Leicester Square Theatre in November 2016 to great acclaim and will tour throughout the UK in 2017 arriving at the Alhambra Theatre, Bradford this June. “The most consistently funny show of his brilliant career … I laughed till it hurt.” The Times ????? “Characteristically twisty and frequently brilliant” The Guardian ???? "Two marvellous misanthropic hours... there's no-one else to touch him" Mail on Sunday ????? 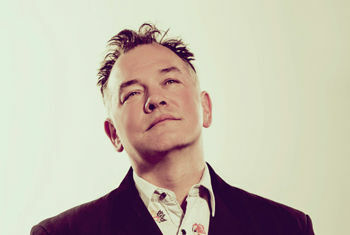 Stewart Lee began stand-up in 1988 at the age of 20, and won the Hackney Empire New Act of the Year in 1990. In 2001 he co-wrote the libretto for Richard Thomas’s Jerry Springer, The Opera, which went on to win four Olivier Awards. His most recent live shows have been Carpet Remnant World (2011), Much A Stew About Nothing (2013) and Room With a Stew (2015). He made four series of Stewart Lee’s Comedy Vehicle for the BBC which won Best Male TV Comic and Best Comedy Entertainment Performance at the British Comedy Awards in 2011 and a BAFTA in 2012. His fourth and final BBC series of Comedy Vehicle is now available on DVD. Stewart is also an occasional newspaper columnist and has recently published a collection of his short prose, also entitled Content Provider.